Yes, almond milk is fine. All plant based milks (almond, rice, soy, coconut, etc.) that are free of sweeteners and additives are allowed, but only for use in “recipes and on cereal” (just not as a beverage, water is the only drinking beverage allowed on the fast). Be Blessed! I’ve not found a vegan yogurt that is Daniel Fast friendly, but if you have and all ingredients are good then it would be fine. All Plant based milks (that are free of additives and sweeteners) such as almond milk, are allowed for use in recipes and on cereal just not as a drinking beverage. I hope this helps! Another easy Yam idea is to slice the yam in about 1/2″-1″ slices, wrap in foil and bake at 350* till tender. Unwrap and enjoy! You can drizzle a little olive oil and add salt and pepper if you’d like or other herbs or spices. I’m going to try adding the raisins! Sounds great! Yes, plant based milks that are free of additives and sweeteners is allowed for use in recipes and cereal. I hope this helps. Is almond milk allowed if it isn’t sweetened? Is unsweetened rice milk, almond milk, or coconut milk allowed (not necessarily to drink but to use if making a natural fruit smoothie or to cook with)? What about un-sweetened almond yogurt and almond milk? Here is a general list of the Daniel Fast allowed foods: All fruits, All vegetables, All whole grains, All whole grain flours (and pastas), All Nuts and seeds, All legumes (beans), All quality oils. Beverages: Water only – spring water, distilled water or other pure waters, and yes, tap water is good, if that is all you have available. MISC Items: tofu, soy products, vinegar, seasonings, salt, herbs and spices (remember, All foods must be free of chemical additives and sweeteners). 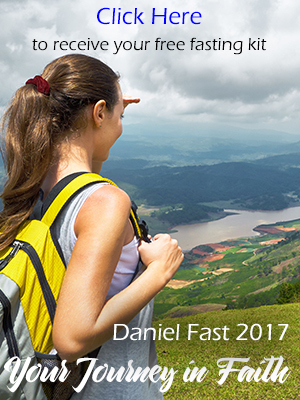 For a complete list you can order a copy of the Daniel Fast Guidelines (which includes the meal planning guide) by going to http://www.daniel-fast.com and enter your email address, they will be emailed back to you. I hope this helps! All plantains are allowed on the Daniel Fast, just make sure they are not deep fried. Be Blessed! Yes, you can. I also like the Aminos to use instead of soy sauce. By the way, it’s a Christian-owned business. Hello, I am on the Daniel fast for the first time. I would like to know if I can use Braggs apple cider vinegar? I will also be praying for you Trinitysmommy. As I read this my eyes filled with tears. Thank you for your service and my our Lord and Savior Jesus Christ be with you as you walk in obedience to the call to fast. What He brings you to He will bring you through. The process to make vinegar as well as wine is fermentation. However, fermentation isn’t the issue with wine, it’s the alcohol and what it does to the mind. There is another book out there that gives the reasoning that since wine is fermented then all other fermented products are not allowed . . . but that isn’t the issue for the Daniel Fast. It has to do with the purpose of wine and the alcohol content, so vinegars including red wine vinegar is allowed on the fast. In fact, Newman’s Own Oil and Vinegar salad dressing is THE only Daniel Fast recommended prepared salad dressing on the fast. I hope this helps! Why is Newman oil and vinegar allowed? Isn’t vinegar on the foods to avoid? Yes, you can lightly coat some french fry cut potatoes with some oil, season and bake them for some baked fries. Can i do french fries using olive oil? Please guide..Thank you and God bless.. There is no sweetener of any kind (Natural or Artificial) allowed on the fast, that would include Agave Nectar and Honey. I hope this helps! praying for you trinitys mommy – your fast is probably over by now, but still praying for your safety. thank you for your service to our country and our freedoms. I was not sure where is the best place to post this but wanted to share a couple recipes. I purchased all ingredients at Trader Joes. Dice sweet potatoes (with skin) to quarter size pieces (or desired size) and place on cookie sheet greased with olive oil. Also lightly coat potatoes in olive oil and dress with preferred seasonings (i.e. Rosemary, sea salt, garlic powder). Bake for approximately 20-30 minutes (depending on oven) at 425 degrees. Stir/flip every 5-10 minutes to avoid burning. When slight browning is noticed, sprinkle a couple hands-full of raisins over top and bake for 5 more minutes. Mango peach salsa & fresh avocado w/ Sea salt on brown rice-cakes. Praise God for amazing food! !